Here's a card that I shared in the Hero Arts Flickr group and I thought I'd share it here today. It's another butterfly card using the template here, and the Dot Flower Pattern stamp from Hero Arts. The template fit the area of the stamp perfectly. Although it appears a little gray, I used Papertrey Ink's Fresh Snow ink on kraft cardstock. The edges of the butterfly were inked for definition, and the sentiment is from my favorite Hero Arts set. The cool felt flower was made from a tutorial by the talented Mary Dawn. 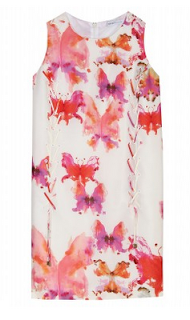 Watch her video and you'll be popping out these blooms in no time at all. Have a great week! Can you believe it's the end of April? Hello, May! Hello, friends! Over the weekend I played with Stacey Yacula's stamps and after visiting her blog, I CASEd her adorable tag. Using an acrylic block as a palette, I tapped on different colors of Memento inks. Watercolor paper was cut into 2.75 by 4.25" tag shapes. Using my waterbrush, I painted circular designs and heat set with a heating tool. Peep was stamped with Archival ink on the colored circles and the sentiment was stamped beneath it. I threaded some contrasting hand dyed rayon seam binding, rounded off the corners, and the tags were done. Here I've attached the tag to a card base. The tags can also be attached to gifts, or used as a bookmark. Peep can be found in the Purple Onion Designs store. She can be purchased singly or in a Sweet Offerings set which includes a leafy branch and a thank you banner. I hope your week is going well. Thanks so much for stopping by today! I took the plunge and entered my first Tuesday Trigger over at Moxie Fab World. I couldn't resist, since my watercolor paper pad and inks were still spread out on the table from an earlier project. It was fate, I guess. Plus, the Trigger is gorgeous! I focused on the butterflies and reached for the set from Papertrey Ink and tested different ways of inking them up. I ended up using a combination of distress inks, Faber Castell brush markers, and Memento inks, and spritzed them with water. I decided to make a long card to mimic the dress, and scored some lines under the sentiment to balance the card. I just love that Paper Smooches sentiment! I'm planning to give this as a monetary wedding card to my sister-in-law who'll tie the knot next month, wishing her "happy everything". The deadline for this week's Trigger is Sunday, April 29th, so there's still time for you to enter. Thanks for stopping by today. Have a happy week! 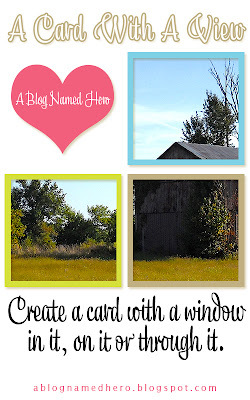 The second challenge at A Blog Named Hero is to incorporate a window on your card or project. Since I didn't ink up the Newspaper Owl yet (even though I got him months ago!) I thought it would be a good time to do so, and enter the challenge. I used Hero Arts' Designer Woodgrain stamp and inked it up with my favorite white ink from Papertrey Ink. The peephole was die cut with some Nestabilities circle dies, and the sentiment was stamped and cut apart for a bit of interest. I decided to add some felt roses and leaves for a pop of color against the kraft background. It's always difficult to get a good shot of a card with an opening on it. I used a bit of repositionable tape runner to close the card temporarily. Here's a closer look at the card and window. Thanks for stoppin' by today. I hope you have a wonderful weekend! The Sweetest Day is coming!